I'm Here. I'm Queer. What the Hell do I read? 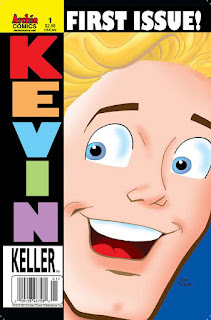 : Kevin Keller - The Out Gay Teen From Archie Comics Gets His Own Comic Book Series! 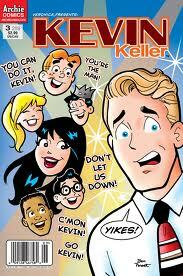 Kevin Keller - The Out Gay Teen From Archie Comics Gets His Own Comic Book Series! 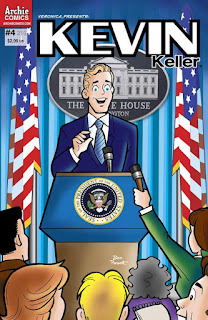 Issue #1 Kevin Keller: There's A First Time For Everything! 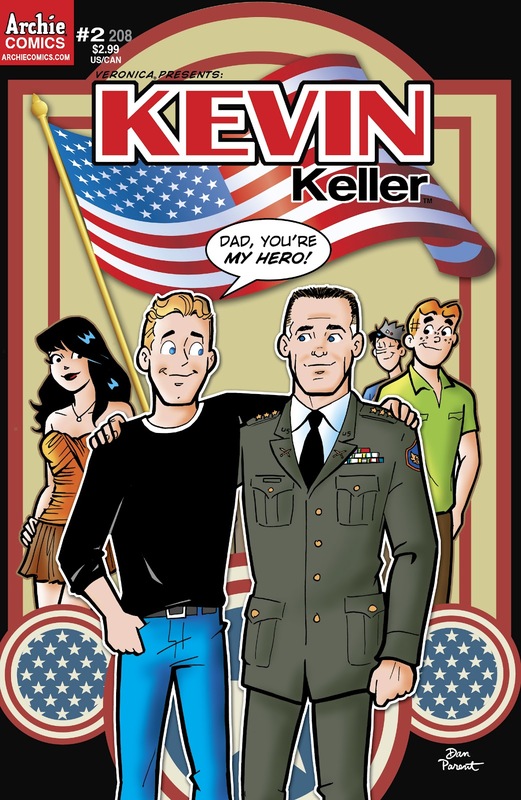 Golden boy Kevin Keller's life is perfect - his family's finally settled down in Riverdale, he has friends, he's openly gay, he's Class President, and he has his own comic book series! The only problem? He also has his first date, with a guy, and he's freaking out. The gang - Veronica, Betty, Reggie, Archie and Jughead all give their newest friend their best advice... Will Kevin keep it together? Will his date (with Brian) happen? Or will it all end in disaster? Everyone's getting ready for a surprise birthday party for Kevin's dad, an Army Colonel. Kevin's going over old family photos with Veronica, and we find out about his childhood dreams of being a superhero. We also learn how he stood up to bullies at his last school - both for himself and for another boy who was picked on. Will the party be a big heartwarming success? Kevin represents Riverdale High School in a Witmasters competition. But the memory of being embarrassed in junior high when he had to speak to a full auditorium (and hurled) adds to his nerves. Kevin studies hard, but when the lights hit and the TV cameras roll, he freezes up. What will happen? Can Veronica save the day? Can Kevin come through? 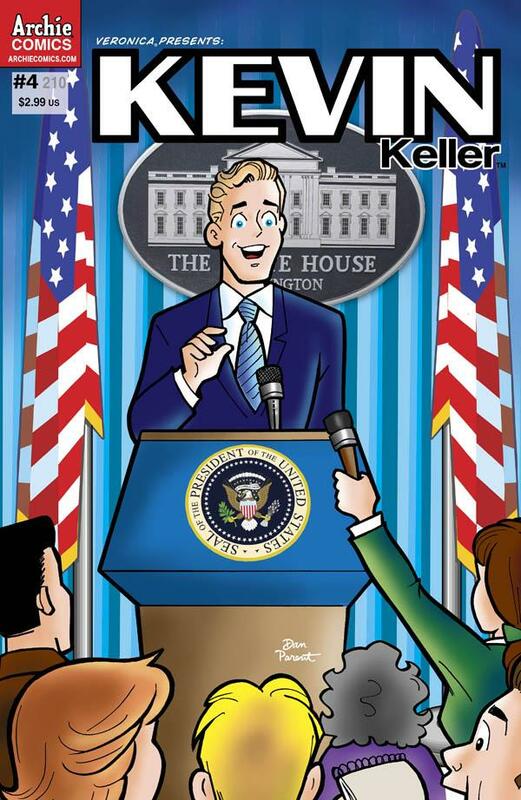 Issue #4 Kevin Keller in Taking The Lead! Kevin's new friends nominate him for Riverdale class president. His biggest rival? David, star quarterback, who's sure no one will vote for Kevin because he's gay, and they'd want a "real man" like David instead. David decides to get Reggie to out Kevin to the whole school so then no one will vote for him. Reggie tells him he's a real lowlife, and lends his support to Kevin. When the big debate comes, David plants the audience with friends who ask leading questions about Kevin keeping secrets. Kevin comes out to the whole school, saying "I'm gay, and I'm proud of who I am! I'm every bit the man that David is. I can do the job just as good as David - make that Better! In fact, I have an advantage! I will be more sensitive to issues of equality, having been discriminated against in the past! I will make sure everybody is treated equally and fairly!" Homophobia in the town and school rears up, and Kevin's parents, and the gang, and Archie, stand up for Kevin. Will Kevin win the election? As Archie tells him, "Win or lose, you're one of the gang! Get used to it!" 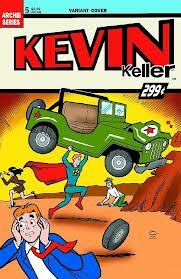 Issue #5 Kevin Keller in Drive Me Crazy! Kevin's desperate for a car of his own, and his Dad gives him his old army jeep. Old, as in falling apart. Kevin's friends soup it up - monster-truck/James Bond style! Before Kevin gets to find out how it all works, the guy he likes, Todd, is in town for only one night. Kevin takes the car and picks up Todd to take him to a drive-in movie... But the voice-activiated car has it's own ideas, and things go crazy! 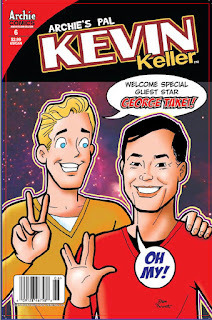 Issue #6: Kevin Keller in By George! The gang are assigned reports on "people who inspire us," and Kevin picks George Takei. His report on the Star Trek actor and gay rights activist is so moving, the school posts it online. George's husband sees the report on the internet, and since they'll be at a comic convention just a few hours from Riverdale, George arranges a special appearance at Riverdale High (which is kept - as a surprise - from Kevin.) Kevin and the gang go to the comic con all dressed up, where Kevin meets up with Brian (the guy he went on the date with in Issue #1!) But when they get to the booth where George Takei is supposed to be signing, he's already left! Will Kevin get his moment to meet his idol? So far there are ten comics in the on-going series, and evidently Kevin gets his first kiss (with boyfriend Devon) in issue #10, which will be out August 7, 2013. Dan Parent, who wrote and drew Kevin, won the 2013 GLAAD Media Award for Outstanding Comic Book! 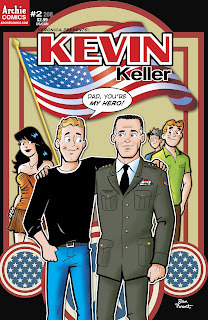 Add your review of any (or all) of the Kevin Keller comics in comments! This looks like fun! I'm an Archie comics fan from way back.